Have you ever thought about your bike’s wheels and what they put up with? 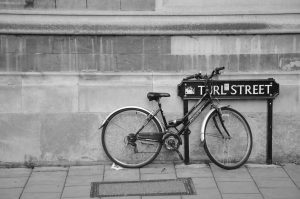 Clothed in a tyre and gripped in a bike frame, all cyclists expect their wheels to carry them along their chosen path. They receive very few words of encouragement but they always come off the worst when met with a pothole, kerbstone or drunkenly placed foot. 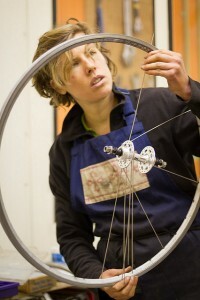 The Broken Spoke Bike Co-op, Oxford’s community workshop, works with the bike wheels of Oxford a good few times a week, servicing, straightening, replacing and consoling, and also running a wheel-building course every couple of months, introducing people to the complexities of their hoops. The lacing together and tuning of these components is both a complex activity and a skill professional bicycle mechanics pride themselves on. That said, the majority of wheels doing the rounds in Oxford are machine built, machine tuned and cheaper than the hand-built wheel. Unfortunately, they are also inferior. Machine built bicycle wheels lack the intuitive holistic construction of their hand-built counterparts. Among other things, the spokes are often twisted and weakened by the tightening process, the rim is thin with minimal reinforcement and the hub is made of flexible steel rather than stiffer aluminium. Practically speaking, repeated introduction of a machine built wheel to the patchy road outside the Old Music Hall (on Cowley Road), the crumbling manhole covers at the bottom of the High Street (travelling westbound), or the disfigured surface just before the roundabout at the top of Woodstock Road, and you’re going to find that said wheel is going to become warped, rattly and reluctant. Have you ever thought about what happens when your bike drops into one of these treacherous chasms? 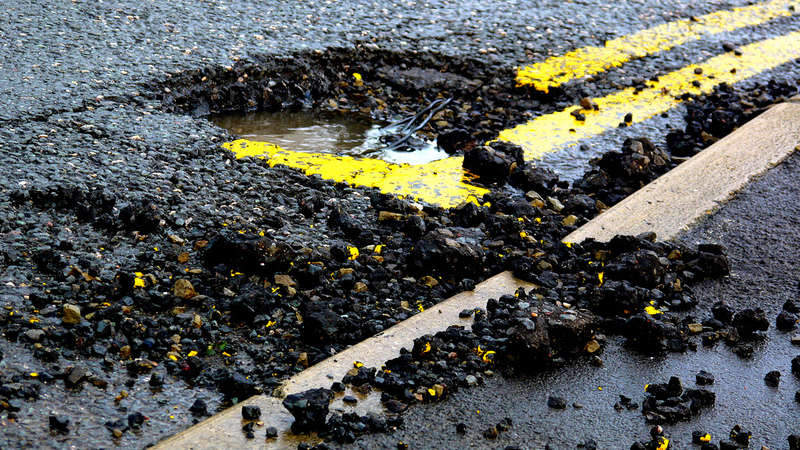 The impact from the pothole travels from road to rider through the tyre and rim at the bottom of the wheel and then into the spokes. The jolt will then be passed into the hub and up through the fork to the handlebars. But do you know where the shock is absorbed? Unless you have a suspension fork or an under-inflated tyre, the spokes at the area of the wheel that hits the ground are where a lot of the shock from the impact is reduced. Their tension reduces considerably. As the wheel continues to spin, this reduction in spoke tension is passed onto the next spokes along, when it’s their turn to be at the bottom of the wheel. But once a spoke has passed the bottom of the wheel, it returns to its original tension. The better built the wheel is, the more times these spokes can relax and spring back without impairing the wheel’s roundness. This flexibility in tension is a big part of why cycling is so popular. 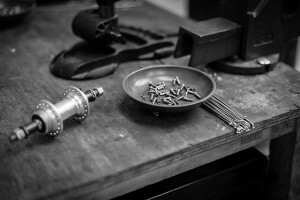 It was only when the rigid wooden wheels of the bone-shaker bicycles of old were replaced with wire wheels, that cycling started becoming a more mainstream, everyday activity. So next time you cleanly bounce over that not-very-lowered-curb on Turl Street, perhaps spare a thought for what’s going on with those spinning bits between you and the road!